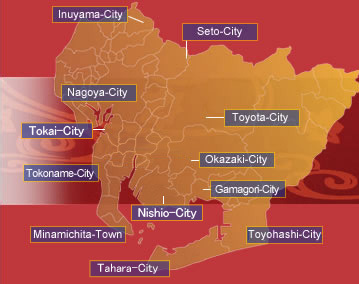 Aichi Prefecture is located near the center of Japan and has prospered as a corridor between the east, west, north and south with a long history. It has a very mild climate.It is surrounded by the rich nature of the sea and the green mountains and has many historical sites and cultural assets.Tourist will be able to encounter local entertainment and festivals as well as homeland foods. Aichi Prefecture is, on the other hand, a base of many industries from the traditional industries of textiles and ceramics to the automobile industry, represented by Toyota Motors, and to machinery and high technology industries such as the aerospace industry.It is a great base for "making things" and has a number of facilities for "industrial tourism" where you can see, touch and experience things. We hope you will enjoy your trip to Aichi where you can experience many fresh surprises.